LeBron James with his sons Bronny Jr (l) and Bryce (r). LeBron James remains the best player in the world, but we may only be a few years away from seeing his son take the NBA by storm. 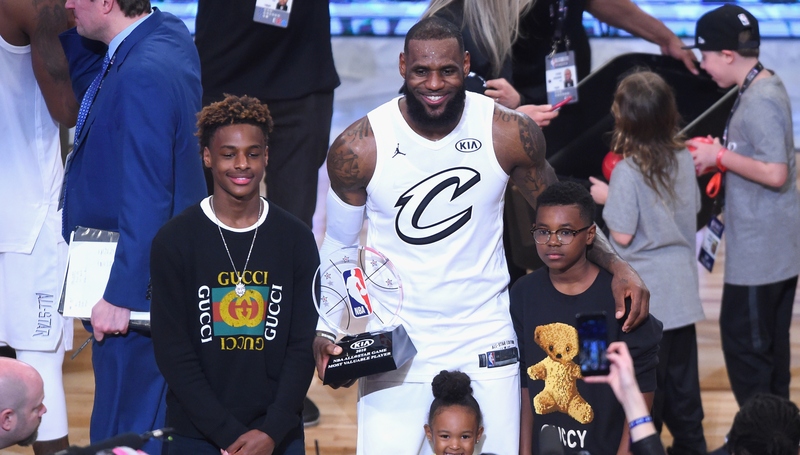 If you haven’t heard, Bronny Jr is a pretty good basketball player in his own right and at the age of 13, he’s already doing things that are getting his dad hyped– like nearly throwing down his first dunk in a game. Playing in the Balling on the Beach AAU Tournament in Miami on Sunday, Bronny Jr stole a pass, raced up the court and took flight for a dunk attempt that was just off the mark. He didn’t stick the landing, but you didn’t need to squint too hard for Bronny Jr to look like LeBron. The play got dad out of his seat and busting out some dance moves and it’s not inconceivable LeBron could be celebrating similar plays by his son as a teammate down the road. Bronny Jr is only entering eighth grade, but he’s already received scholarship offers from top-tier programmes like Duke and Kentucky, according to ESPN. His development may be so important to LeBron and the family that it could potentially play a factor in James’ free agency decision this summer. There have already been rumours that LeBron has scouted out high schools in the Los Angeles area, where Bronny Jr could be exposed to better competition than he’s so far faced living in Ohio. James has also stated that sharing the court with his son would be “the greatest achievement of my life”. 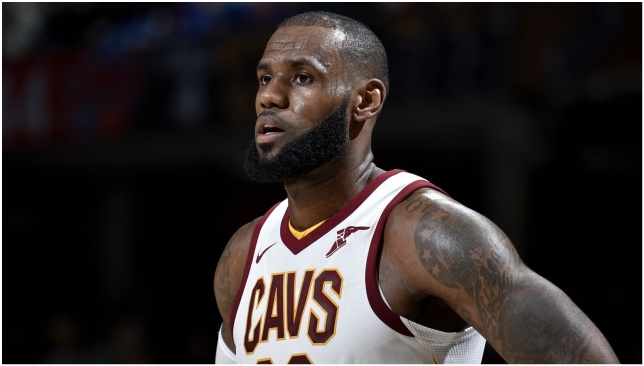 In footage released by James’ multimedia platform UNINTERRUPETED earlier this month, LeBron said: “You want to ask me, ‘What was the greatest achievement in my life?’ If I’m on the same court as my son in the NBA. That would be No1 in my lifetime as an NBA player. Bronny Jr could reach the league earlier than usual because the NBA are reportedly considering doing away with the one-and-done rule, which requires prospects to wait at least one year after high school before entering the draft. If the change comes, it may take effect as early as 2021, according to ESPN’s Zach Lowe. Bronny Jr is set to graduate high school in the summer of 2023, which means there’s a chance we could see father and son playing together as soon as five years from now. Carmelo Anthony is coming off the worst season of his career. 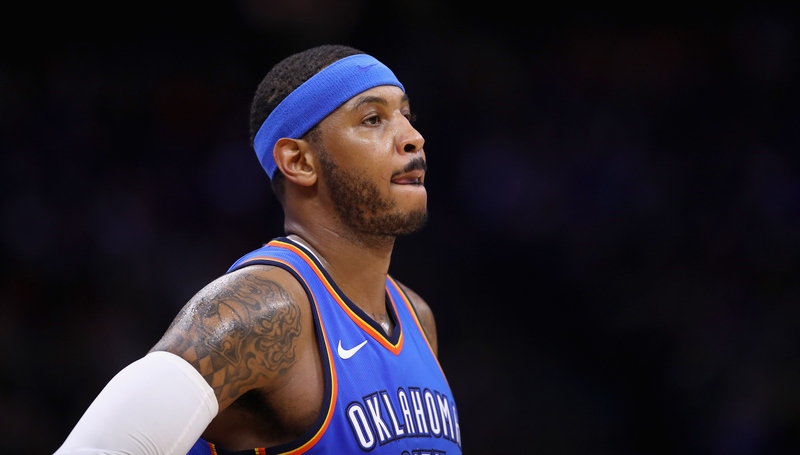 Unsurprisingly, Carmelo Anthony didn’t exercise his early termination option on the final year of his contract, meaning he’ll return to the Oklahoma City Thunder next season while being paid $27.9 million. Anthony could have chosen to opt out and hit free agency, but the 34-year-old likely wouldn’t have received anything close to his current annual salary on the open market. While he’s a 10-time All-Star – and was named one as recently as 2017 – Anthony is clearly on the decline and coming off the worst season of his career, in which he averaged 16.2 points on just 40.4 per cent shooting in his first season with the Thunder. 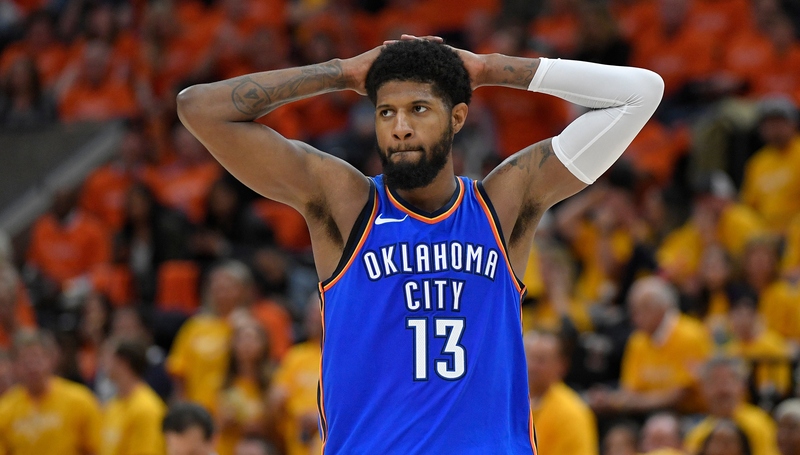 Oklahoma City were expected to be title contenders with a core of Anthony, Russell Westbrook and Paul George, but were instead bounced out of the first round of the playoffs after a wildly inconsistent campaign. Anthony’s role was in question throughout the season after he came over from the New York Knicks, where he was the main man and primary shot-taker. Playing alongside Westbrook and George – two players definitively more equipped to carry a greater offensive burden at this stage of their respective careers – Anthony struggled to settle into a supporting role. After the season, Anthony didn’t sound like a player who is willing to scale back even further and give more room to Westbrook and George. “I think the player that they wanted me to be and needed me to be was for the sake of this season,” Anthony said. “Should I say, because it was just so – like I said, everything was just thrown together, and it wasn’t anything that was planned out. It wasn’t no strategy to me being here, me being a part of the actual system and what type of player and things like that. Anthony also once again shot down the idea of coming off the bench after laughing off the suggestion before the season. When the Thunder traded for Melo last season, they always viewed it as a two-season thing. There was never any expectation he would decide to opt out. Now it's about trying to get back on the same page before next season. Of course, if the Thunder and Melo can't resolve his role concerns and such, OKC could negotiate a contract buyout, discuss trade options (Melo would need to waive his no-trade clause) or use the stretch provision. Nothing happening on those fronts yet, though. It seems as if Anthony still believes he’s the type of player he has been for most of his career – a high-volume, go-to scorer – rather than what the current state of his skills dictate – a spot-up threat and primary option on the second unit. In fairness to Anthony’s steadfast belief he’s still a starting calibre player, the Thunder’s five-man starting lineup of him, Westbrook, George, Andre Roberson and Steven Adams had a net rating of plus-14.2 this past season, which was third-best in the league among units to log at least 300 minutes. The lineup never realised their full potential as Roberson suffered a season-ending ruptured left patellar tendon at the end of January, just when it appeared Oklahoma City were finding their rhythm. 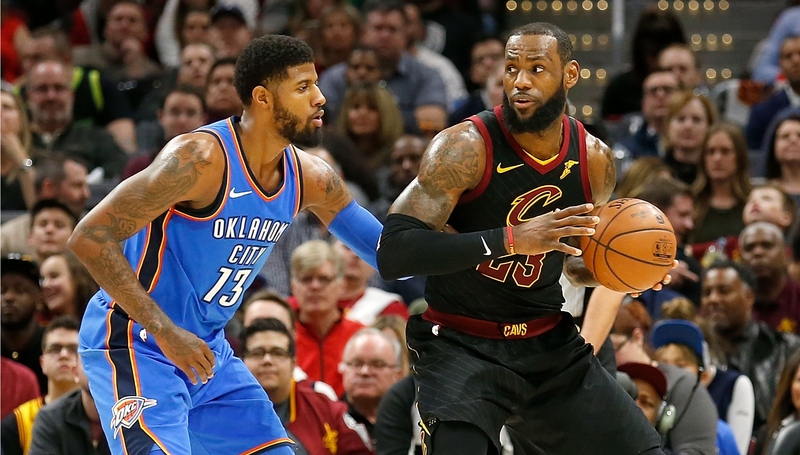 That lineup may not get a second chance as Paul George could be on his way out in free agency, with the star forward heavily linked with the Los Angeles Lakers. If George does leave, the Thunder may not have any other choice but to leave Anthony to his own devices and expand his role on offence. With no other proven shot-creator on the roster other than Westbrook and the team over the salary cap even without George, Anthony should get his opportunity to put up numbers in a contract year. That situation would fare well for Anthony, but it’s unlikely to lead to much success for the Thunder. However, that’s the gamble the franchise made when they traded for a flight-risk in George and then acquired Anthony, who was never going to opt out of the final year of his contract.